Offering you a complete choice of products which include oval shape mirror. 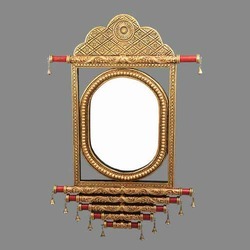 Wall Hanging Hand Crafted Oval Shape Mirror Mural in Ceramic Crush Material With Wooden Base, Fine Hand Crafted Art Work, Washable Material , Pure Brass Bells With Natural Duco Paint Finish. Purpose = It can be Use personally & can be Gifted also.